What a great video this is. Lindsey Buckingham, for the casual fan like myself, is probably mostly thought of as part of Fleetwood Mac. Well, he does nod to that part of his career in this live show, with solo versions of Fleetwood Mac songs. He doesn’t really try to make them sound like Fleetwood Mac songs, though. I don’t say that as a complaint, but rather as a statement. This is a Lindsey Buckingham solo show, and the Fleetwood Mac cuts make that clear in their delivery. They are still recognizable and entertaining. They are just not Fleetwood Mac clones. Anyone looking for that should probably steer clear. 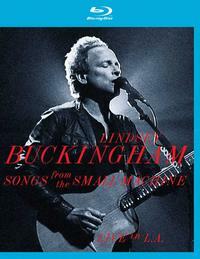 Really, though, why would you want that from a Lindsey Buckingham performance? What you get are powerfully emotional vocals and killer guitar playing. This man can really play the guitar and bring a lot of emotion out of that performance. This is a great show that features music from various parts of Buckingham’s career. He starts the show alone on the stage, but after a few songs other musicians join to fill out the arrangements. Buckingham’s the star, though. The performance is awesome. The video is excellent and the audio is great. In addition, there’s a cool interview. You really can’t go wrong with this thing.